Long into the future, when ideas have been exhausted and pony toys are no longer the hot new thing, Friendship is Magic will join the other fandom spawning titans as a relic of the good days. 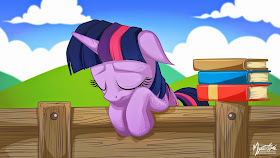 Twilight Sparkle and her team of pony friends that have had such a massive impact on so many lives will ride off into the sunset, and the world of Equestria will be handed off to the fans to hopefully keep things going. It's a sad prospect, but all good things must come to an end. Fortunately, many of us have taken that core message of the show to heart and made boatloads of friends. We may find ourselves looking back 20 years from now and reminiscing time well spent with our compadres from ponyland. So, what do you plan to do once the show is over? Will you keep gobbling up fan content, or more on to something else? Chances are we aren't going to see this pony train end anytime soon, but feel free to discuss away in those comments!